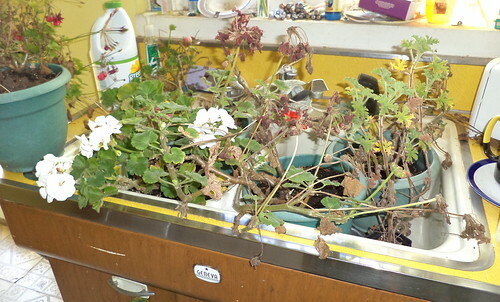 Before I left on vacation, I thought I should bring in my geraniums. But, as vacation grew closer and closer, I was so busy and they were easily forgotten. Plus, the weather was downright balmy for Chicago in late October and early November. I left Chicago on a day when it was to be 74 degrees with the night cooling off to the upper 50s. That's hardly weather to bring in your geraniums. The Friday I was in Anaheim, California, the temperatures in Chicagoland dropped. It was in the upper 50's with lows in the low 40s and dipping down to the upper 30s. Too much of that and I don't have geraniums anymore. I was, however, exhausted from traveling and the geraniums stayed outside, even when I wound up scraping frost off the Jeep window. I knew I was tempting fate, but was too tired to make an effort to resist it. Finally, last week, I brought them all in. Some were pretty straggly from a summer of benign neglect. Some were in desperate need of more potting soil. Thank you squirrels. I took off all the dead foliage, trimmed back a couple which were in danger of tipping over the pot. That thing called "gravity" is not kind to an unbalanced plant. I watered; really soaked them; and added plant food. Everyone looks okay. The white blooming geranium is, I think, destined for my new office. I'll need to get a nicer pot than the green nursery pot it spent the summer in. I have to figure out where to put the big pink geranium, not shown in the photo. I'm thinking it would do fine in the back room. I just need to find a sturdy chair or something on which to put it. And so we have lasted through another growing season. Now to remember to water these more than once every 3-4 weeks.